DATUK Teng Chang Khim will be very busy this year. Having inherited the Selangor government’s investment, industry and commerce, small and medium enterprise and transport portfolio five months ago, the senior state executive councillor (exco) has two key projects to roll out by the end of the year. If successful, the projects will spur SMEs in the state to actively embrace e-commerce to widen their reach and see Selangor host more international expos, like the Guangzhou International Convention and Exhibition Centre that hosts the Canton Fair twice a year. By developing the e-commerce landscape in Selangor, the state government hopes to encourage SMEs to use the platform to conduct business with the world. This focus on developing the industry and commerce landscape comes at a time when attracting foreign direct investment (FDI) to spur economic growth in the state is becoming increasingly difficult. Though touted as the most developed state in the country, Selangor has lost out to some of the other states in bringing in FDI because of its high land prices. And compared with Johor, it lacks a compelling proposition like Iskandar Malaysia. “Even if we keep putting in all our effort to lure FDI, we are actually struggling in the red sea. We have to go to the blue ocean — industry and commerce,” Teng tells Unlisted & Unlimited in an interview. “We have a lot of potential here … But we don’t realise it,” he says. The Selangor government aims to help 100 SMEs in the state to go online this year by offering training courses and subsidies as an incentive for businesses to establish an online presence. “Having [SMEs] do promotions in other countries or attend expos is very costly. If they can go online, it will help them very much to market their products to the world,” Teng says. Teng says the setting up of the Selangor Digital Creative Centre by June will help start-ups enter the business world. It will serve as a co-working space to encourage networking, spur creativity and resource sharing among entrepreneurs. Such efforts will help the local business community tap the global market, as Malaysia’s small population limits their reach. “Asean itself has a 600 million population, and when you go a bit further to China and India, that’s more than a billion each. We have to look to the outside world,” he adds. Meanwhile, the Selangor International Exposition in mid-November is expected to attract 1,000 traders and manufacturers from around the world. The state’s sizeable population, talent pool and quality infrastructure, such as Port Klang and the Kuala Lumpur International Airport, are some of the factors that will help Selangor pull off an international expo — the first Malaysian expo to be organised by a state government, according to Teng. “For this expo, we will focus on business-to-business (B2B) [transactions] for merchants. We want to develop this and turn it into an annual event. If it is successful, we will have more [expos],” he says, adding that this is in line with promoting Selangor as an international trading hub. The expo will focus on attracting merchants from five sectors — machinery and engineering; life sciences, such as biotechnology, pharmaceutical and medical; transport equipment, including automotive, aerospace and maritime; food and beverage; and electrical and electronics. It will also centre around halal products, a niche market for Malaysia because of its reputation as a hub for Islamic finance and halal certification. A successful expo will also help develop Selangor’s service industry, which contributes 56% of the state’s gross domestic product (GDP), compared with the manufacturing industry’s 30%. The state’s GDP grew at 6.1% last year and is projected to expand 5.5% this year. This compares with the national forecast of 4.5% to 5.5%. Teng also talks about the state’s transport plan and the controversial hudud issue. The following is an excerpt from the interview. Unlisted & Unlimited: We understand that you are keen to promote e-commerce in the state. Can you talk about your plan? Datuk Teng Chang Khim: In Malaysia, we have successful online businesses, like AirAsia. People buy tickets online and pay by credit card. However, I will say our online service is quite primitive without a comprehensive ecosystem. If we look at China, there is a third party payment gateway. If you put an order online, the money will be paid to the third party. The logistics company will then deliver the goods to the consumer. After seven days, if there is no complaint about the goods, the money will be paid to the merchant by the third party. If the item is found to be defective, it is returned to the merchant within seven days and the third party will refund the money to the consumer. We are trying to work out something like this. But the problem is, the money kept with the third party for seven days is a big sum. We not only need a mechanism but also a law in place. We also need to set up a tribunal to resolve disputes. What is the progress of your e-commerce plan? We set up the Selangor Information Technology and e-Commerce Council two months ago. We gathered technology providers and a representative from Multimedia Development Corp (MDeC) to sit on the council. Pua Khein-Seng (the “father of the pen drive”) and Zhan Hong Zhi (the godfather of e-commerce in Taiwan) are our advisers. We are working via the Internet and conference calls currently. Under this e-commerce initiative, we will offer training courses and subsidies as an incentive for 100 SMEs to establish their online presence. We are going to set up the Selangor Digital Creative Centre. This will provide a co-working space for start-ups so they don’t have to spend money on renting an office. They only need to go to the centre and pay a nominal sum to get a desk and chair. We will have periodical meetings between investors and these start-up entrepreneurs for them to do the matching. What is the budget allocated for this e-commerce platform? Also RM5 million. Actually, my portfolio has been getting only RM1.6 million a year from the state government for development purposes. Then I persuaded it to give me another RM10 million on top of the RM1.6 million. What has Selangor done recently to attract FDI? I went to Singapore last month to promote Selangor. Despite Singapore being one of the main investors in our country, I was surprised to be informed that the last time we went to Singapore to do a promotion was 10 years ago. However, we successfully raised doubts in their mind to make them start thinking: Besides Iskandar, should we go to Selangor? They go to Iskandar because of the proximity. But look, in 2020, the new high-speed rail will be ready. It will only take 90 minutes from KL to Singapore. And in terms of infrastructure, Selangor is better than Johor. In the next round, we hope to bring along our industrial park developers and property players to Singapore when we promote our state. Apart from looking at the bigger picture and having more information, they will know exactly what kind of land they can get. 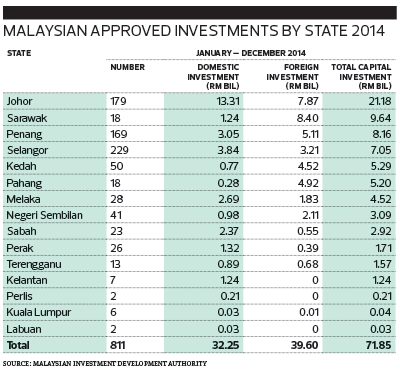 What are the other countries the Selangor government wants to attract to invest in the state? Japan. We made a proposal to provide a place for the Japanese to build a Japanese industrial park in 2013. It was initiated by Ean Yong Hian Wah, Selangor Exco for local government, new village development and legalisation of factories, but it has not materialised. The Japanese take quite a long time to make decisions as they are very prudent. So, we have to follow up. We are also going to attract more investments from China and Europe. Although Europe is in crisis, they are about to come out of it. There may be opportunities. How did you come up with the idea of hosting an international expo in Selangor? Selangor has the best infrastructure and talent pool in Malaysia. All this makes the state a potential trading hub to hold the expo, and to link merchants with the Asean, China and India markets, which have a total population of three billion. This year, we are targeting 1,000 booths in bringing people to come and trade here. We will concentrate on B2B transactions and allow traders and manufacturers to have a nice trading experience. It is not going to be a high-class pasar pagi [morning market]. Once it is done successfully, it will be like the Canton Fair held in China every year, which sees people rushing in. This is how we are going to promote Selangor. We start from small to make the state an international trading hub. Will this expo be held based on the model of the Canton Fair, one of the most famous trade fairs in the world? More than that. They do it twice a year. If we are successful, we will do it every month. In Yiwu, China, they have expos almost every week. We have the advantage to do this. Malaysians speak different languages and we have ready interpreters everywhere. I see this as our potential that can be unleashed. After people come and trade here and the volume is big enough, they will start to think it is better to set up a plant here as it will be more cost-effective, rather than bring goods from other places into this region. This will attract more FDI to Selangor. What is the business volume that you expect the expo to attract? We are not thinking about the volume yet. The Canton Fair has been held for decades and is able to collect data, but we are starting from zero … Hopefully, this expo will have a good start, and later on we will think about having a permanent venue, our own expo centre where we can hold international events. Is the Selangor government fully in charge of the expo? No, this is not a project of the state government alone. We will provide the facilities and funds. The state government agencies will only serve as the secretariat in the organising committee. The members of the organising committee will comprise representatives from all the chambers of commerce — the Chinese Chamber of Commerce and Industry of KL and Selangor, the KL and Selangor Indian Chamber of Commerce and Industry, the Malay Chamber of Commerce Malaysia — and SME Association of Malaysia. They have experience in attending and organising expos. We have an allocation of RM5 million for this trade fair. It will be held in the third week of November. Currently, we are running against time; we sit together and work out the details almost every week. 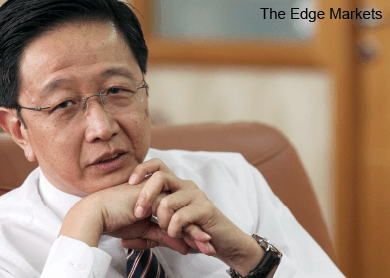 Will the 1Malaysia Development Bhd issue undermine your efforts to market Selangor? It will not have a direct impact. But of course, it has given Malaysia a bad image. But then, this happened under the federal government, which is not as transparent as the Selangor government. The 1MDB case will not happen in Selangor because we have a very strong check and balance mechanism. We have the Select Committee on Competency, Accountability and Transparency (Selcat), which has the power to call for a public hearing. We have committees to look at local government, land offices and district offices and a committee to oversee the administration of the state government-linked companies. In the coming state assembly, we will have 14 reports from these committees. The Penang government has come out with a long-term Transport Master Plan to overhaul the state’s transport system and resolve traffic woes. Will Selangor have one too? Yes. We are going to have our Selangor Public Transport Master Plan ready within six months. We are not in the position to implement it alone because it involves the jurisdiction of the federal government. We also don’t have the resources since all taxes are paid to the federal government. This master plan is to complement and match what the federal government is going to do. We are the planning authority, so we know about the situation of Selangor better than the federal government. We will discuss our plan with the federal government to avoid any unnecessary transport planning. Currently, we have our free community bus in PJ. We are going to start one in Shah Alam soon. There are also three other local governments that have submitted their proposals to me. However, our fund is limited. I asked for RM12 million to implement the free community bus this year in four cities, but I was allocated RM3.5 million for public transport. Will the hudud issue affect Selangor’s PR solidarity? As far as I am concerned, there is no hudud in our common policy framework in Pakatan Rakyat (PR). In this case, there is no issue in Selangor. In Selangor, it can’t even pass through our exco to be tabled at the state legislative assembly. Do you think PR will continue to rule Selangor? I think we are doing pretty well. Our reserve is still accumulating. The latest figure published is RM3.2 billion. Why do you think PR is doing well? We don’t seem to be attacked by Barisan Nasional these days on all our projects. There are no allegations of corruption on our government, and there is no hanky panky in the projects we carry out. In fact, when I was in charge of the local government (under the previous menteri besar), I commissioned Merdeka Centre to conduct an independent survey every six months on the people of Selangor. The results showed that the people were happy. This article first appeared in Unlisted & Unlimited, The Edge Malaysia Weekly, on April 13 - 19, 2015.